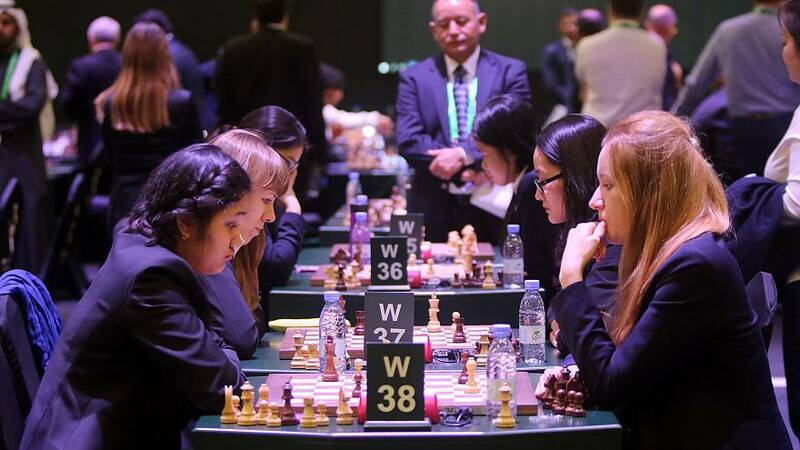 A new chess championship that kicked off Tuesday in Saudi Arabia's capital is gaining international attention for its more progressive direction, thanks to the inclusion of female competitors. But the lack of something else — players from Israel and Qatar — has spotlighted an ongoing rift in a region where tensions still run deep. The World Chess Federation denied that any country's team was being purposefully excluded from the King Salman World Blitz & Rapid Championships 2017, which runs through Saturday and has attracted some of the top-ranked chess players from 55 countries. Israeli chess officials, however, complained Sunday that a request to Saudi Arabia for Israeli players to participate was ultimately ignored. On Tuesday, the Israel Chess Federation wrote a letter to the World Chess Federation, which is overseeing the event, demanding that the tournament be canceled for the next two years and that Israeli players who were denied visas and not allowed to participate be "compensated." In a statement, the World Chess Federation didn't mention Israel but addressed other reports that claimed two countries with strained ties with Saudi Arabia — Qatar and Iran — were also barred from the country. "The fact that players from Iran and Qatar may decide not to participate, after consulting their own authorities, is clearly their own individual decision," the statement said, adding that the appropriate visas had been granted. The Qatar News Agency confirmed that the country's chess team would not compete after they were initially told they could "not display the Qatari flag at any stage during the competition." The World Chess Federation clarified in its statement that it did suggest Qatari players use the federation's flag out of security concerns, but that contestants who wanted to play could still do so under their own flag. Division between the two nations reached a new level over the summer, when Saudi Arabia was one of four countries to cut diplomatic ties with Qatar over its ongoing support of Islamist groups and relations with Iran. Qatar, a gas-rich nation, has denied funding extremists. Saudi Arabia has also had alongstanding proxy war with Iran, with both laying claim as the Middle East's major regional power. The kingdom, meanwhile, has no official diplomatic ties with Israel, although there have beeninformal meetings between the two countriesover their shared concerns about ISIS and Hezbollah, U.S. officials said in November. Lior Aizenberg of the Israel Chess Federation told Reuters that it may seek legal action against the World Chess Federation regarding this latest tournament. "The event is not a world championship if they prevent chess players from several countries from taking part," Aizenberg said. The World Chess Federation did tout Saudi Arabia's first time hosting a chess championship as a milestone in a country where only last year a top cleric claimed it was "forbidden" in Islam because it encouraged gambling. Women are being allowed to compete as well, and won't have to wear traditional robe-like coverings or headscarves. It's another step forward, some say, for women's rights in Saudi Arabia, where a ban for females to drive was only lifted in September. This tournament is also notable for its shared prize pot of $2 million — offering the champions more money than they would normally receive in a chess competition. No women qualified for the "Open Section" of the championship, where the winner will snag a $250,000 prize, organizers said. The winner of a separate "Women's Section" will earn $80,000.